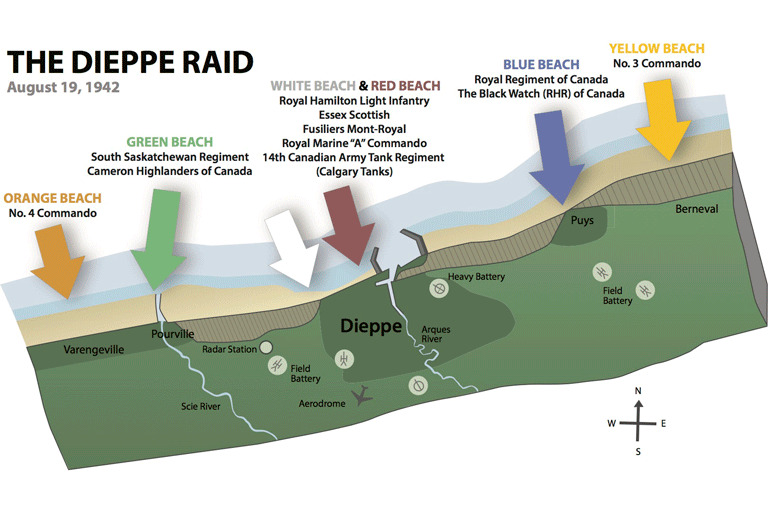 The Dieppe raid of August 19, 1942, was a disaster. Within a few hours of landing on the French beach, almost a thousand Canadian soldiers died and twice that many were taken prisoner. Losses of aircraft and naval vessels were very high. It took a long time for the 2nd Canadian Infantry Division, which had provided the foot soldiers for the assault, to recover. This debacle, spun by those responsible as a glorious failure that paved the way for D-Day two years later, sits like a scar on the Canadian memory of the war, and so it should. 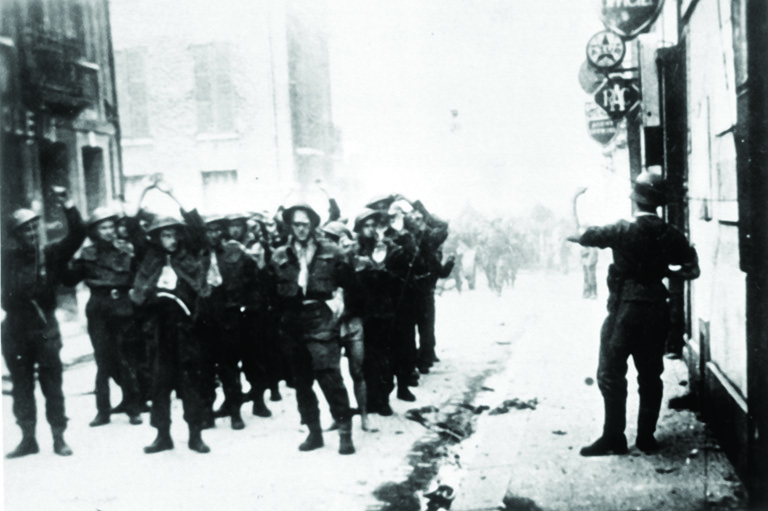 Contrary to the public relations experts of 1942, Dieppe was a colossal blunder. 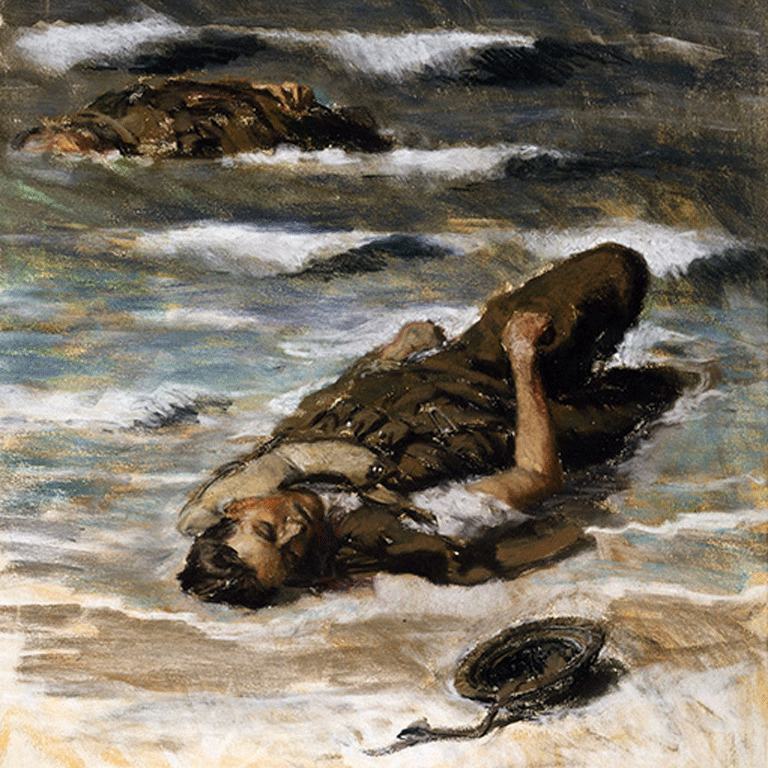 A colour sketch of a casualty on the beach at Dieppe. The raid began in optimism out of the Canadians’ desire to see action. By the spring of 1942, Canadian soldiers had been in Britain for more than two years without combat. For the expanding Canadian army in Britain, there was only training and more boring training, while the troops helped defend England against an invasion that was never to come. The idea of conducting a large raid on the French coast originated in Combined Operations Headquarters, commanded by Vice Admiral Lord Louis Mountbatten. The planners wanted to test the theory and practice of amphibious warfare, and essentially to determine if a defended port could be seized. That was the main tactical reason — but there were political reasons too. The Americans, in the war only since December 1941, wanted to create a second front on the Continent as soon as possible, a goal that Moscow, bearing the full brunt of the war against Germany on the eastern front, shared. In Canada, politicians wanted their troops to get into action to gain battle experience and to appease a public clamouring for heroes. Overseas, Lieutenant General Harry Crerar fretted about the “continued lack of participation” in operations and the difficulty of maintaining the “desired keenness and morale.” The Canadian generals knew their restless soldiers needed action, and the troops themselves, tired of being asked by their English girlfriends if they would ever fight, largely shared that opinion. “Like every other soldier,” Corporal Robert Prouse of the Canadian Provost Corps recalled in a published account of his war experiences, “I was bored to tears with the long inaction and was itching for battle.” Everyone wanted and needed a big raid on the Continent. By the time McNaughton returned to England in April 1942, the British had agreed. The 2nd Division was chosen for the job. General Bernard Montgomery, the operational commander under whom the Canadians served, thought it the best-trained Canadian formation. And Montgomery viewed its commanding officer, Major-General J. Hamilton Roberts, as the best of the Canadian division commanders. Two days later, Crerar wrote that the Canadian commanders of the raid “expressed full confidence in being able to carry out their tasks — given a break in luck.” Senior officers ordinarily put more faith in good planning and in their troops’ ability than in luck. Operation Rutter, the original raid, was scrubbed by Montgomery in the first week of July 1942 because of bad weather. In the interval between Rutter and the renewed operation, Montgomery left for the Middle East to find his destiny. The 2nd Division’s destiny would prove to be very different. The decision to let loose Operation Jubilee, as the planners dubbed the August raid, came from Mountbatten, McNaughton, Crerar, and Roberts. The commanders knew that soldiers had talked in the pubs about the cancelled raid on Dieppe in July; they banked on the likelihood that the Germans would not believe that the Allies could be so foolish as to have the same troops attack the same target a month later. Crerar’s comment on the revived plan, offered on August 11, was that “given an even break in luck and good navigation” the raid “should” prove successful. Once more, luck was the key. Unfortunately, there was none in Operation Jubilee. The plan called for 4,963 officers and men drawn from the infantry battalions of the 2nd Division and an armoured regiment from the 1st Canadian Armoured Brigade to assault Dieppe and surrounding areas from the sea. Covered by seventy-four squadrons of fighters and fighter-bombers overhead and ten small ships offshore, and accompanied by tanks of the Calgary Regiment, infantry from the Essex Scottish from southwestern Ontario and the Royal Hamilton Light Infantry were to land on the beach in front of Dieppe. Toronto’s Royal Regiment of Canada was to go ashore on a tiny beach under a cliff at Puys to the east. The South Saskatchewan Regiment and Ottawa’s Cameron Highlanders were to disembark at Pourville to the west. The Camerons intended to go almost eight kilometres inland to attack an airfield, a German headquarters, and destroy a coastal battery. The floating reserve was the Fusiliers Mont-Royal. The commandos’ task was to eliminate German batteries east and west of the three main landing areas. The intention of the raid was to take the town of Dieppe, establish a defensive perimeter, and hold it just long enough to permit the destruction of harbour facilities. The raiders were then to depart by sea. There were no heavy bombers to soften up the defences, and the Royal Navy declined to assign battleships to support the assault — the English Channel was too risky for that with the Luftwaffe nearby. The German defences at Dieppe were in the hands of the 302nd Infantry Division, and ample reserves were close by. The raiders boarded their landing craft on August 18 and set sail that night. Very quickly, everything unravelled, starting with the flotilla running into a German coastal convoy. The firing alerted the coastal defences, removing the element of surprise on which the entire plan depended. The Royal Navy landed the Canadians on Puys’ Blue Beach thirty-five minutes late at a time when they could easily be seen by two platoons of Germans on the beach and in a pillbox on the cliff overlooking it. Attackers from the Royal Regiment of Canada were cut to pieces by German machine guns and mortars, and only a few made it to the top of the cliff. Those still alive on the beach surrendered at about 8:30 a.m.; those atop the cliff held out until the late afternoon. Only sixty-five Royals out of almost six hundred made it back to England. At Pourville’s Green Beach, the situation was only marginally better. The South Saskatchewan Regiment landed on time in darkness and achieved an element of surprise, but the Royal Navy landed part of the unit in the wrong place. One company, properly landed, took its objective. The rest, trying to cross the River Scie on a bridge, faced withering fire from the Germans perched on the cliffs on both sides of the landing beach. The South Sasks’ commander, Lieutenant Colonel Cecil Merritt, led his men across by sheer force of will: “Come on over, there’s nothing to it,” he said, standing up and swinging his helmet. Merritt then led attacks up the hill with his troops, joined by part of the Cameron Highlanders (who had landed with their pipers playing). The remainder of the Camerons moved inland some two thousand metres until they encountered very heavy opposition and withdrew to the beach. The landing craft to pick them up were there, as planned, but very few of the survivors could reach them through the hail of machine-gun fire the Germans laid down. Merritt stayed to organize the defences that let those who made it get away. He was taken prisoner and soon received the Victoria Cross. The real disaster was in front of Dieppe on the Red and White Beaches. The enemy heard the firing from Puys and Pourville and was at the alert, so there was no surprise, and without surprise there was no chance of good luck. The only advantage had by the attackers was the air attack on the cliffs to the east of the beaches and the strafing of the beach defences by British Hurricane fighter planes. The infantry landed while the Germans tried to collect themselves after the air attack, but the navy deployed the Calgary’s new Churchill tanks late,and the big armoured vehicles managed to do little, many failing to get over the seawall, others unable to move on the baseball-sized stones that made up the beach. Without immediate fire support, the infantry took heavy casualties from the defenders perched on the cliffs that overlooked the beach and from the fortified casino at the west end of the beach. Some of the Royal Hamilton Light Infantry broke through the Germans’ wire and made it into the town. Like most of the RHLI, the Essex Scottish, raked by fire from the east and west headlands, died or fell wounded where they had landed. The carnage was compounded when garbled messages that suggested success led General Roberts to send in his reserve battalion. Montreal’s Fusiliers Mont- Royal landed at 7 a.m. and met only slaughter. Allied soldiers taken prisoner at Dieppe. By the time it was over, 907 Canadian soldiers had died on the beach, 586 had suffered wounds, and 1,946 had fallen into German hands. British Commandos and Royal Marines had forty-five killed and 197 wounded or captured. The Royal Navy lost twenty-eight percent of the vessels used in the raid and 550 officers and ratings. And the Royal and Royal Canadian Air Forces had 106 aircraft shot down, the heaviest single day’s losses since the beginning of the war. What had gone wrong? Everything is the proper answer, but some points should be stressed. Raiding France was a useful tool for the Allies to force the enemy to keep troops in the West rather than Russia, and yes, it was correct to test invasion theories. But it was a mistake to remount a once-cancelled operation, even if the Germans did not learn that Jubilee was a repeat of Rutter. It was an error not to have heavy bombing precede the assault and a huge blunder to fail to have big naval guns firing offshore. The operational plan was unrealistic in the extreme — every problem was wished away for fear the raid might be cancelled and the Canadians not get their chance. It made no sense, for example, to expect the Cameron Highlanders to go eight kilometres inland, presumably in contact with the Germans the whole way, and then to return to the coast for embarkation, all in a few hours. It was foolish to depend on surprise above all, and extremely foolish to go on with the attack once surprise was lost. It was hopelessly unrealistic to count on luck to make up for failures in planning. Those failures in planning were huge, but there were more. It was utmost stupidity to attack a defended port where cliffs and headlands dominated the beaches. Where else would the Germans put their firepower? It was madness to land on a beach in front of Dieppe, where stones impeded the tanks’ progress. Did no one think? Did no one try out the Churchill tanks’ ability to manoeuvre with their treads on stones? It was as if Dieppe was on the far side of the planet where none had ever travelled, rather than being just across the English Channel, a day trip that English visitors had taken for decades. The lack of good sense, and the failure by Mountbatten’s staff, Montgomery, and the Canadian planners to apply simple intelligence to the plan, created the monumental disaster. Dieppe was an object lesson on how not to mount an amphibious assault. Back in England, nothing mattered except that reputations be saved. The Dieppe raid became a model of how to spin the facts, as historian Timothy Balzer has conclusively demonstrated. Mountbatten’s expert public relations team turned out to be better at preparing their media lines for failure than his planners had been at drawing up the strategy for operational success. Combined Operations Headquarters instantly claimed that the raid had been a great achievement and learning experience, and they held to that line even after the casualty lists became public. Two years later, Mountbatten’s boosters maintained that without Jubilee’s invaluable invasion tutorial D-Day could not have succeeded. General Crerar said much the same, and, understandably perhaps, so have most Dieppe survivors, not wanting their comrades to have been thrown away for nothing. The key question, however, remains: Did the lessons learned from Operation Jubilee pave the way for D-Day, June 6, 1944? Yes, to some extent. After Dieppe, everyone recognized the need for better planning and a clearer chain of command. Operation Overlord — the name for the invasion of Europe that began with the D-Day landing — satisfied those requirements. There was heavy bombing, though it was not hugely successful in destroying beach defences. There was massive naval gun support, which was successful. There were better landing craft and specialized armoured vehicles, and the assault troops were far better trained. All of those things would likely have happened even without the Dieppe raid. And instead of landing at a fortified port, the D-Day invasion went in over open beaches, and the Allies brought their artificial port, Mulberry, with them. Some lessons were learned, but most of them were lessons that had been mastered before. Many of them had been taught at staff colleges for decades. Most of them were simple common sense. The Globe and Mail, a newspaper bitterly opposed to the Liberal government in Ottawa, was one of the few to openly criticize the Dieppe operation. In the spring of 1943, when ministers defended the raid in Parliament, the Globe called the raid “a fiasco of the first order; a tragedy of military blundering without parallel in this war.” The newspaper had it right: The blunders at Dieppe were and remain inexcusable. This article originally appeared in the August-September 2009 issue of The Beaver. An updated view, “Dieppe: The Secret Purpose Behind This Disastrous Second World War Raid,” by David O’Keefe, appeared in the August-September 2017 issue of Canada’s History magazine.